This week, I recovered from a memorable weekend. Not, it wasn’t a party type thing. This was a soul restoring thing. This was a game changing kind of thing. This was the start of something amazing. But let us start at the beginning because, frankly, I was really bad at tell everyone what was going on when it was going on. A couple of months ago, I was the winner of the Owl of Minvera Award, which is sponsored by the Minerva Rising Literary Journal. I won with a proposal that created a writer’s retreat for 4 to 5 AfroLatina women in Galveston, Texas. That in itself is pretty cool. Here I was, a writer trying to revise my latest novel and now I was a person creating opportunities for other writers. What?! Yes. I became a person who rented beach houses, designed menus, thought about writing exercises, and hoped to create a space so fantastic that art would be created. It made me have a great appreciation for the people who put retreats together. While it was one thing to plan the retreat, picking who would come to it was something different. In a quick turnaround, a call for applications made one thing clear — it wasn’t going to be easy choosing the ladies who will be part of this retreat. There was so much talent out there. So. Much. Talent. This was crazy! Through the process, I chose five ladies whose art was as deep as their desire to write. I picked Alicia Anabel Santos, Guadalis Del Carmen, Maria Elena Montero, Marilou Razo, and Jasminne Mendez. As a result, this past weekend was memorable, epic, and life changing. Yes, life changing. I have found another writing community. I have lived in my purpose and I love it. 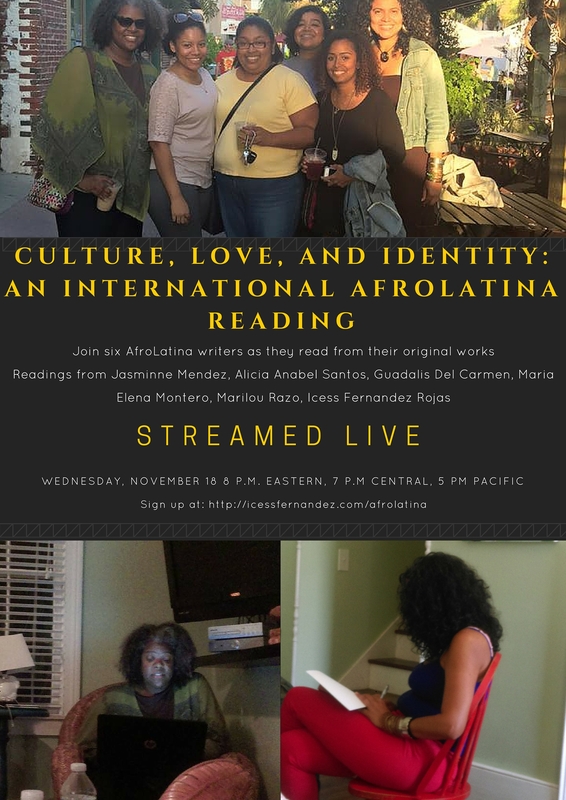 As if that wasn’t enough, we are having an international reading Nov. 18. INTERNATIONAL! That means that if you live in Paris, France or Paris, Texas you will be able to watch the reading! The reading will be at 8 p.m. Eastern, 7 p.m. Central, 5 p.m. Pacific. You’ll be able to watch it on your mobile, tablet, and computer. All you’ll have to do is click on the link. To get the link, sign up below. We’re going to be sending it out the closer we get to the event. Please, sign up and get ready to hear some great writing. Reblogged this on And Labels to Bear Before I Die.